12 noon Stations of the Cross for children. Hot Cross Buns after the service! and blessing of the Paschal Candle. Confirmation and renewal of our Baptismal vows. Who have recently been confirmed in their Christian faith. Now and always growing more and more like Jesus. Table - including cakes. BYO nibbles and drinks. Tea and coffee included. assisted by funding from Burnside Council Community Grants Program. In the Church of the Holy Saviour we are in the presence of the Cross which was crafted by Peter Moritz of Adelaide in the mid-1980’s. It has main elements of polished wood enclosing suspended glass tiles. 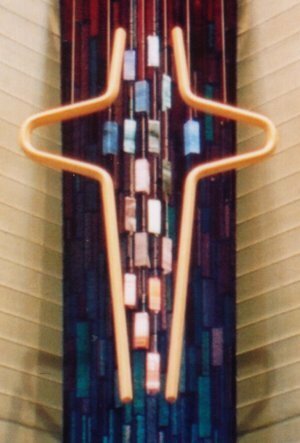 This Cross is hanging high in the large Sanctuary providing a focus for our attention. This hanging Cross overlooks what we do in worship and life. This raised Cross is a victory cross. We look upwards to the shining presence of the tiles and colours going from earth, sea to sky. It is an open Cross, open-ended, top and bottom. The love of Jesus Christ is open and available to all people, flowing out of the cross, Jesus dying for us, ‘ love so amazing, so divine’, alongside others in their modern crucifixions. Then there are the shadows of the other crosses. Sometimes, with the church lights on we can see the shadows of three crosses as in the crucifixion of Jesus. They crucified him with two others, one on either side of him; Jesus between them as the central focus.